Mr. Lif's debut for Mello Music Group shows the Bostonian emcee growing as both a lyricist and a songwriter more than ever before. In Boston, there is no greater emcee than Mr. Lif, and for good reason. His topical lyrics make him a hit in his East Coast hometown, and has garnered him praise from big names like Jedi Mind Tricks and El-P. Even with this fame, though, Mr. Lif has been out of the musical spotlight ever since his last album, I Heard It Today was released, and many wondered when he was going to return with a project. 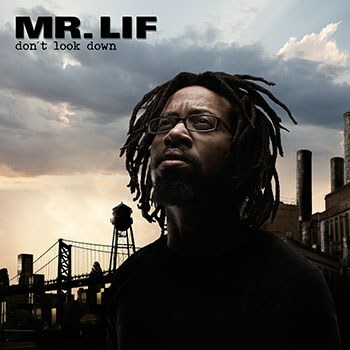 Now, however, Mr. Lif is finally making his comeback with Don’t Look Down, an album that shows the famed Bostonian improving not only as a lyricist but as a songwriter as well. In recent years, some of hip-hop’s best albums have been conceptual in nature-such as Kendrick’s Good Kid, M.A.A.D. City and To Pimp a Butterfly, YG’s My Krazy Life and Danny Brown’s Old-and Mr. Lif’s debut album for Mello Music Group is no different. Beginning with “Pounds of Pressure” and “The Abyss”, Don’t Look Back tells the tale of a man who murders someone in order to protect his girlfriend and the resulting Post-Traumatic Stress Disorder that haunts him. On songs like “Everyday We Pray” and “A Better Day”, he finds solace and optimism through religion and self-motivation, while “iLL” and the title track reflect the more horrific and depressing side of PTSD. Conceptually, it’s a unique story to base an album on, and Mr. Lif fleshes it out by looking at PTSD through many, multi-colored lenses and perspectives. Though Mr. Lif has been criticized for being too garrulous on his past albums, this isn’t the case at all with this new one. Alongside guest rappers Blacastan, Ak and Del, the conscious emcee crafts concise, thoughtful and poetic lyrics. Lines like “Please scale these walls with me / And dissolve memory / Of this vile prison / That we've called living” and “It's that uncompromising silence / That either leads to violence / Or opens up the sky / So you can fly / Your own pilot” succinctly capture the protagonist’s emotions in a way that’s remarkable, down-to-earth, and vivid all at the same time. Sometimes, though, Mr. Lif falls victim to the strict, self-imposed restriction that’s required to make a concept album. “Pounds of Pressure” and “The Abyss”, while they make for an excellent, action-packed start to the album, should have been one song. It’s impossible to appreciate “The Abyss” without hearing the opener, and vice-versa, since Mr. Lif is so focused on relating the full narrative with these two tracks. Deeper in the album, “World Renown”, though a fantastic song with a great guest feature and dense lyricism, is too similar both thematically and lyrically to the song preceding it and could easily be cut out and re-inserted as a bonus track. Nevertheless, these issues do not lower the quality of Don’t Look Down that much, even if they do occasionally ruin the flow of the album at times. What Don’t Look Down does suffer from are Mr. Lif’s voice and his subpar choruses. Though the Bostonian never had the gruffness of Ghostface Killah or the smoothness of Jay-Z, his voice sounds decent at its best and grating at its worst, which is a shame. With such layered rhymes schemes and profound lyrical content, Mr. Lif makes much more than simple, clichéd pop-rap, and it’s sad that his messages can be overlooked simply because he has such a unique tone in his voice. However, while he can’t change his voice, he can change a couple of his choruses, which are either rudimentary or outright lame. The opener and closer on the album are good examples of this, where his bad hook writing negatively impacts otherwise fantastic songs. Granted, he does have some great DJ scratches and female guest vocalists to do most of the choruses for him, using them to close the musical gaps that he is unable to fill himself. If anything, at least Mr. Lif is self-aware of his musical failings, and usually manages to minimize them throughout this album. In more ways than one, Mr. Lif’s six-year hiatus from music is much more a blessing than a curse. Unlike his previous albums, which can be as preachy and wordy as a reverend and his pulpit, Don’t Look Down is a tight ten-track project with an overarching theme that it seldom deviates from. Yes, it is difficult to truly appreciate any one song without hearing it in the context of the album, and sometimes the production may feel a bit thin. However, none of these issues can take away from the fact that Don’t Look Down packs seven years’ worth of Mr. Lif’s thought-provoking lines within a captivating concept and theme. It is a solid, enthralling effort by Mr. Lif, and hopefully we won’t have to wait another six years before he follows up with another album as good as this one.